The turkey you’re about to consume today is probably a sharia bird dead set on the destruction of apple pie and football nationwide. Ayn Rand acolyte (and defender of xenophobes and birthers nationwide), Pamela Geller, filled us in on Butterball’s nefarious deal with Al Qaeda and Muslim housewives. Non-Muslims in America and Europe don’t deserve to have halal turkey forced upon them in this way, without their knowledge or consent. So this Thanksgiving, fight for your freedom. 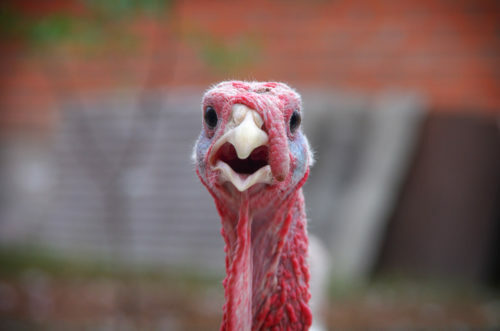 Find a non-halal, non-Butterball turkey to celebrate Thanksgiving this Thursday. And write to Butterball and request, politely but firmly, that they stop selling only halal turkeys, and make non-halal turkeys available to Americans who still value our freedoms. Maybe someone should have told those staunch defenders of Israel that kosher birds are killed the same way. Why do Pam Geller and Bryan Fischer hate the Jews? Then again, maybe someone did since they shifted the “war” a month later to a more Christian holiday. And for the record, Republican president Lincoln made Thanksgiving a national holiday in an attempt to bring the North and South together. The racist Southerners rejected the day originally as an assault on their traditional values. I guess somethings never change, eh?